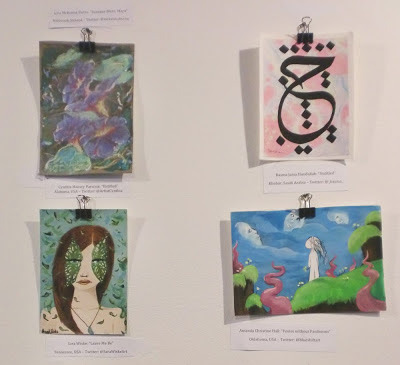 The #twitterartexhibit concept was first organized by David Sandum, a Swedish-born artist who began using social media to organize artists to create a fundraiser to help a children's library in Moss, Norway. The first exhibit received postcard-sized art from over 260 artists in 24 countries. A second #twitterartexhibit was held to raise money for a women's shelter, and sales collected over $4000 (U.S. dollars) for the cause. I was proud to send work each time in support of both causes and am happy to have connected with all the artists I have met online who have been participating. And... they are doing it again in 2013 here in the U.S.
All required for artists wishing to participate is a Twitter account- and sending your postcard-sized art submission. This third installment of the exhibit will prove to raise even more money for more charities, so the more submissions, the merrier! Below is the piece I worked on last night, acrylic on primed, unstretched canvas mounted with a flat backing and varnished before mailing. The exhibit will be held at the Exhale Unlimited Gallery in Los Angeles, CA, from January 12- February 10, 2013. Proceeds benefit Art Division LA. The full call for entries is here: http://twitterartexhibit.org/callforartists - I hope you will consider submitting or stopping by during the show to purchase a piece from one of your favorite artists. You can follow updates and artist updates about the show through the #twitterartexhibit hashtag.